How to access blocked websites at school? How to access blocked websites in college WiFi? How to get on any blocked website at school, college and work? And how to access blocked websites on school computers? These are some of the most common queries that always get asked on the web by school & college students, and employees. Because in most of the colleges, schools and offices, the administration use to block various social networking sites (Facebook, Twitter, Google+, and Instagram etc) and other useful websites due to many specific reasons. While accessing blocked websites using proxy servers and unblocking restricted internet access using website unblocker software has become more and more manageable, there are still many straightforward methods that you can use in order to access blocked websites at school, college and workplaces. This tutorial will perfectly explain you about the all possible methods to unblock restricted internet access so that you can access blocked websites or content anywhere comfortably. Let’s know the methods to get into websites blocked by your school, college, or office. Addition to the most preferred ways to access blocked websites using proxy servers and Google translate, I have listed some more interesting ways to access blocked sites which have ability to unblock blocked sites and open almost any blocked websites on the internet. Accessing blocked websites using proxy servers is one of the simplistic ways and everybody prefer to use proxy sites in order to unblock restricted internet access. Basically, the web proxy website is nothing but the online proxy server which redirects you to the blocked website instead of directly connecting to the websites that are blocked at your place. The best advantage of using proxy servers to open blocked sites is that you can securely surf the internet without your information being available to hackers, spammers, and scammers. There are countless of free proxy sites and best free proxy servers available on the web that allows you to access blocked websites anonymously. Only, you have to open a Proxy Server and enter URL of the blocked website inside the input Box and then simply click on submit or search button (as shown in above screenshot). Immediately, it will show the blocked website. Thus, you can see how simple is to access blocked websites using proxy servers. If you are looking for the quickest and simplest way to open blocked websites then Google Translate is really a nice option for you. Using Google translate as a web proxy server you can easily access any blocked website from your work, school or college’s WiFi or other internet connection. First of all, open Google Translate and then enter the Blocked site URL address (which you want to access). After that, select any of your regional Language (like: Hindi, Arabic) and then click to translate. Once you have done these steps, you will be able to access the blocked site. Now, enjoy the websites that are not blocked. Google Translate has the ability to support more than 70 different languages including Hindi, Arabic, and Spanish etc, so you haven’t to be worried about supported language. Hide My IP is an award-winning VPN tool for Windows, Mac, and Android OS that helps you to hide your IP address to keep secret your identity on the Internet and access blocked websites anonymously. The tool is packed with multiple awesome features like changing your IP address, encrypting internet connection, sending anonymous email, enjoying private web surfing and accessing websites that are blocked etc. This secure proxy VPN software offers more than 80 IP locations to choose from and enjoy anonymous web surfing. Only you have to Download Hide My IP Tool and start enjoying its exciting features. Other above-mentioned methods help you to access the static websites only, you can’t use the social networking sites like Facebook, twitter, Instagram, Myspace etc. It’s because the social networking sites use the browser to store cookies and which isn’t possible by using these web proxy servers and proxy websites. In this condition, you need to use a secure browser-based network. If you like to use a secure web network and want to protect your privacy or anonymity on the web then using TOR Browser is really a relevant selection for you. Basically, Tor Browser is a free software for Windows, Mac OS X, or Linux system that helps you to access blocked websites and enjoy private web surfing. Even, it can run off a USB flash drive. At first, Download TOR Browser from its official website and install it on your PC. Once the installation process is completed, click Finish to launch Tor Browser’s wizard. Now on the Tor Browser’s wizard click the Connect button. 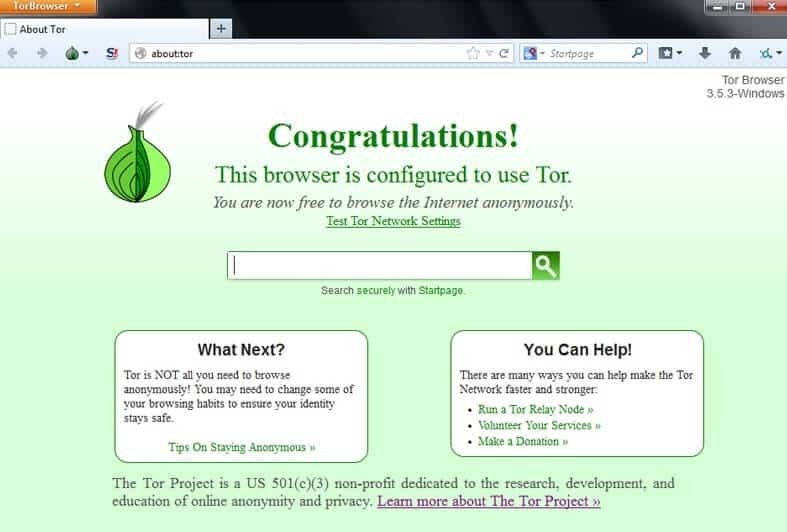 Once the browser is configured to use Tor, type the URL of blocked site and start surfing the web anonymously. Accessing blocked websites using TOR Browser is really very secure and perfectly protects your privacy or anonymity on the web. Give it a try and share your view with us. Hola is another appropriate method to unblock websites at school, college and workplaces. Hola is a well-known browser extension available for all popular Web browsers. With the help of Hola Browser Extension, you can comfortably browse the internet anonymously. Go to the Official website of HOLA and install browser extensions directly from there for your preferred Web browser. Start accessing any blocked website anytime, anywhere! Hola is completely free for non-commercial use and charges a small fee for commercial use. Addition to this, its VPN service works on all your devices (Windows, Mac, Ipad, Android, iPhone), you can even use it on multiple devices at the same time. In many colleges, schools, and workplaces the websites are normally blocked using particular website blocking software that prepares a database of the Websites they need to block. So, whenever you enter the domain name (URL address) of any website then that website will simply get blocked. At first, Press Windows + R keys together to open Run dialog box. After that, type cmd in the open section and then press Enter. Now command prompt Window will appear. In the command prompt type ping websitename.com and hit enter. Thus, you can easily find the IP address of any website using the Windows command prompt. Once you got the IP address of the websites that are blocked, now you can access those blocked sites using their IP address. Read the below method to know how to open blocked sites using IP address. Opening blocked sites in office, school or college using IP address is also a quite popular method and many internet users apply it whenever they wish to use blocked sites in the restricted internet access area. Once you got the IP address of the websites that are blocked (as explained in above method), now open your favorite web browser and type the IP address of the blocked site and then press Enter in order to access blocked websites using IP address. Popular Search engines like Google and Yahoo store the cache of each and every website often. So, you can access the cache of any website using Google’s old cache. It’s also a very helpful and easy to use method. To access blocked sites using Google cache, open Google.com and search for the Blocked website which you wish to access. Click on small down arrow sign which is located just next to the website URL and then click on Just search for the BLOCKED website which you need to open and click on the Cached link as shown in above screenshot. WayBack Machine is also a very usable option if you wish to make use of Cache for accessing blocked sites at school, college, and Office. Basically, the Wayback Machine is a digital archive of the World Wide Web and all other information on the Internet created by the Internet Archive. With the help of WayBack Machine, you can clearly know about the previous Look of any website/blog from its archives. Only, you have to enter the URL address of the blocked website and start checking or access the previous versions of the website that are blocked at your Place. For the example: the above screenshot shows the previous look of Twitter.com at the time of 2007. In the above method, I explained the process to access blocked websites using IP address. But what you will do – if even the IP address of the website that you need access was also blocked? In such circumstance, opening blocked websites using Decimal Code is a suitable solution. With the help of decimal numbers, you can also access any blocked websites because almost none will even block the IP address in decimal. You can readily get the decimal code of IP address using IP Address To Decimal Calculator. Only you have to, enter the IP address of blocked website and press the Calculate button. For the example: If the IP address of Google is http://74.125.236.160/ then you can use the decimal format instead http://1249766560. Both will take you to the same place. Nowadays, most of the website uses the secure connection. Specially, all the popular websites like Facebook, Google, and Yahoo allow their visitors users to surf securely. In order to access blocked websites at school, colleges and work, instead of opening the blocked websites in http:// format open them in https:// format. I have already tried it and it helped me to access blocked websites on school computers. For the example: If Facebook.com is blocked in your school & college then you should try to open http://www.facebook.com/ as https://www.facebook.com/. This trick will help you a lot and you might be able to access blocked sites even in the restricted internet access area. As we all know, normally URL shorteners are used to shorten the length of the lengthy URL address to remember them easily. And when the short URL is opened then it gets redirected to the actual web address. But the interesting thing is that you can use URL shortener services to bypass the security and access blocked websites. I have used this method to access Facebook in my college WiFi to chat with friends and my Girlfriend. For the example: If Facebook.com is blocked on college & school computers then using online URL Shortener tools likes bit.ly or goo.gl you can shorten the Facebook.com’s URL and can perfectly access the sites even if they are blocked. TINY URL and MooURL are also very effective URL shortener services for this purpose. It’s quite strange to know that we can access blocked websites using email services, but yes this is true. Web2mail is a web based email service which sends web pages information to your mail. Only you have to Sign Up for Web2mail and request them to send information of the blocked site to your email. Since, most of the email services like Gmail, Yahoo and outlook are compatible with the html in mails, so you can easily access blocked websites from your email as well. This is a secure way to use blocked sites. These days, all web browsers support proxy for allowing users to surf the web anonymously. There are tons of web proxy sites available on the internet that provide Proxy IP address and Port list for free of cost. Some of the most popular proxy sites list to grab proxy IP address are – HideMyAss Proxy List, Free Proxy Lists, inCloak Proxy List etc. First of all, go to Settings and click on Show advanced settings. Under the Network section, click on the Change Proxy Settings button. After that Internet Properties popup will appear. Click on the LAN Settings button. Now, on the next popup window check “Use proxy server for your LAN” option. And also check the “Bypass proxy server for local address” option. Finally, press OK and save. That’s it! Now, you are ready to surf the web anonymously and access blocked websites. At first, go to Options and select “Advanced” option wich is located at the top of navigation section of the popup window. Next, go to the “Network” tab and click on Settings button which is located under the Connections section. Now, add the Proxy IP address in the HTTP Proxy section and Check the “Use this proxy server for all protocol” option. Finally, Press OK and save. Now, you are ready to surf the web anonymously and unblock the blocked websites. All these website unblocker tools are well compatible with all versions of Windows including Windows Vista, Windows XP, Windows 7, Windows 8, Windows 8.1 and Windows 10 operating system. Download the website unblocker software according to your wish and enjoy free access to your favorite sites. We hope, you got some amazing methods to open blocked websites in school, college and workplace. If you have still any queries (how to access blocked websites at work, school or college? How to access blocked websites without proxy server? How to get on any blocked website at school? etc) then feel free to ask us through comments. Did you like these above-mentioned top 15 methods to access blocked websites at school & college? We would love to know – if you have any other interesting methods to access blocked websites at school, college and workplaces? First of all welcome to zerodollartips.com and thanks for sharing/asking your view with us about accessing Blocked Websites at College. Hey Dipu first of all, you need to get the WiFi password from your college authorities (if possible) and once your device is connected to the WiFi, you will be able to start accessing your preferred sites using above-mentioned methods to access Blocked Websites in School & College. Thanks for sharing your thoughts about access blocked websites. Dude, my school computer knows all sites and I can’t remove the setting for the proxy. These guys are smart. Very soon this web site will be famous among all blog visitors due to its pleasant articles or reviews. I do not even know the way I finished up here, but I believed this publish was once great.